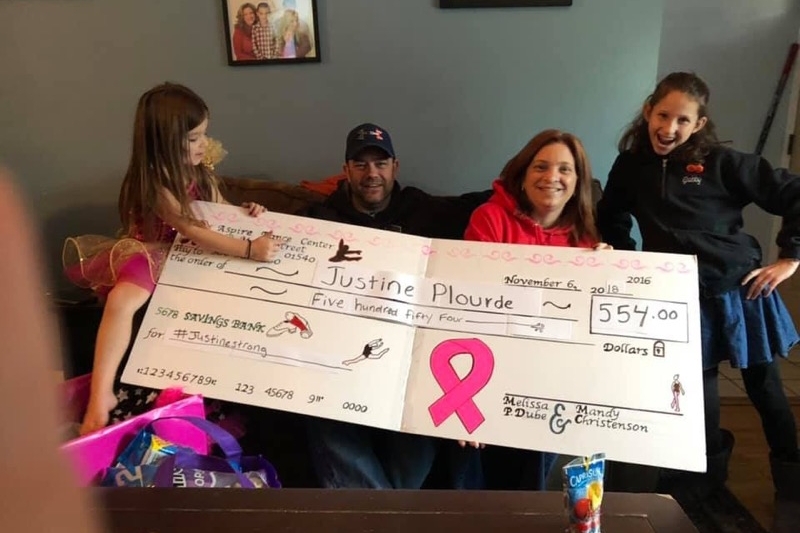 As some of you may know, Justine Plourde, a loving wife, mother, sister, auntie, and friend was recently diagnosed with Stage 4 Breast Cancer. Back in May of 2018, Justine tripped and fell at work. Justine began to receive routine physical therapy due to her fall but Justine’s condition continued to progressively worsen. At a follow up appointment due to the painful spasms from her fall, Justine located a lump in her breast that she thought was a strained muscle due to her fall. Her doctor decided to schedule a routine mammogram, which Justine had not previously had because of her age. At this appointment, Justine also received an ultrasound and biopsy due to the mass that was located. Two days after the appointment, Justine was admitted to the emergency room with a fractured back. Justine was transferred to Mass General Hospital to see a specialist immediately. Five days later Justine’s family received results that they believed the cancer might have spread which may have led to the fracture in her back from a minor fall. Over the next month, Justine went through multiple procedures, tests, and biopsies, which confirmed that the cancer had in fact spread to Justine’s bones. Justine has had undergone some intense treatments of radiation already. These treatments were daily and on multiple different areas. The treatments have weaken her immune system and lowered her energy level. 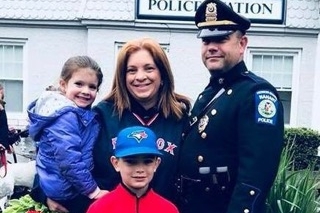 Justine was not able to care for herself, so her husband JR also needed to take a leave from work to assist caring for her and their two young children. Justine is hopeful that she will be able to return to work eventually, however, there is no cure for her diagnosis. Justine will need to be on medicine for the rest of her life and her treatments will change as needed depending on which treatments will react well for her. This will require future leaves of absence from work for her and her husband. Justine is one of the strongest, most selfless people I have ever known and is always there to give her love and support to anyone who needs it. She is cheerful, loving, and unbelievably strong and always puts her friends and family before herself. Now it is time that we send back some of that love and support to Justine. What is most important is that we surround Justine with all the love and support we can so she can focus her energy on the fight ahead. The Go Fund Me page is intended to help her pay for medical expenses as she goes through the process of fighting breast cancer. 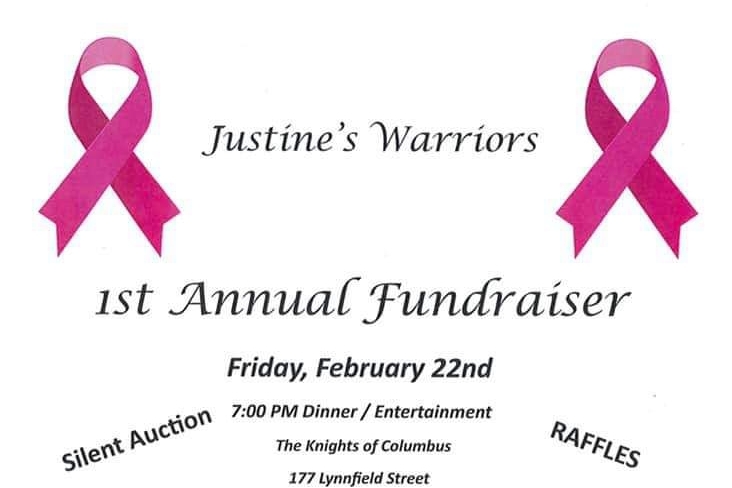 We are reaching out to friends and family to support Justine and her family with the financial burden of medical bills and daily costs of living. There is no amount to small and every donation is greatly appreciated by her family. We thank you in advance for your support. Remember money is not the only thing you can offer. Post on her Facebook page or on this gofundme page with words of love and encouragement and pictures and remind her how strong she really is! She may not always respond, but know they help. If anyone would like to donate an item that would be greatly appreciated. We would like to thank everyone who has donated or shared the campaign for #JustineStrong. The support and generosity is overwhelming for the family but much needed and appreciated. 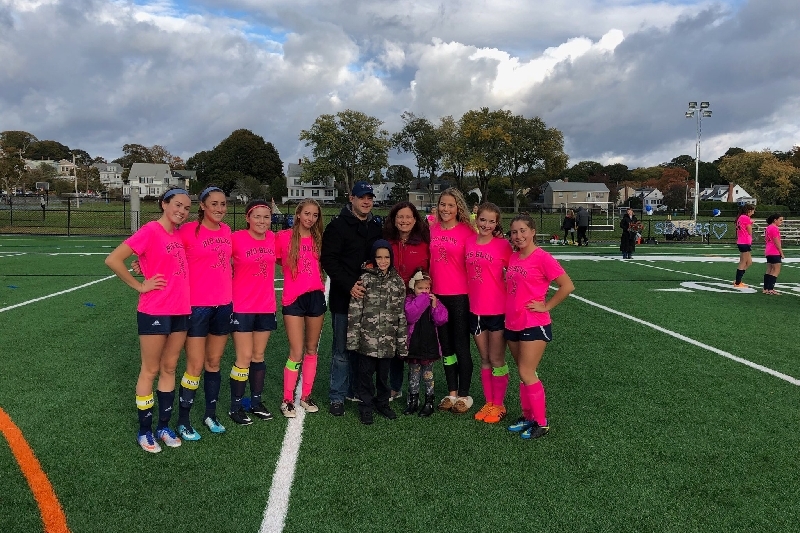 A special thank you to the Nahant Police and Nahant fire department, Swampscott Girls Soccer Teams, Aspire Dance Center and everyone who has continued to donate. Justine recently underwent her first round of scabs since her original diagnosis. They consisted of bone scans, CT scans, and ultrasounds. She was pleased to learn at her recent appointment the results showed the treatments are working and her body reacting well to the medication.The doctors at MGH have agreed to continue with Justine's current treatment plan, because they are satisfied with its results. They did not feel they would change anything at this time seen the cancer has been receptive and feel the treatment plan is still the best available option to treat Justine’s cancer. They are going to continue with this treatment until they find the results not as successful or if Justine begins to not be able to handle the treatment. The medication she is on can cause lower blood counts which puts her immune system at risk and also increases her chance for infection. They will continue to monitor her blood work. Justine also continues to have weekly physical therapy to regain the strength in her back. They have now placed their focus determining if Justine’s back will continue to improve or if this we be her new normal. Justine’s back pain does limit her activities. They have also adjusted her pain medication with the hopes that it will also help make her more comfortable on a more consistent basis. These past few months have taken a real toll on Justine and JR, but they continue to persevere through it all. They are each other’s strength but they couldn’t do it without the help of all of you, their families and friends. 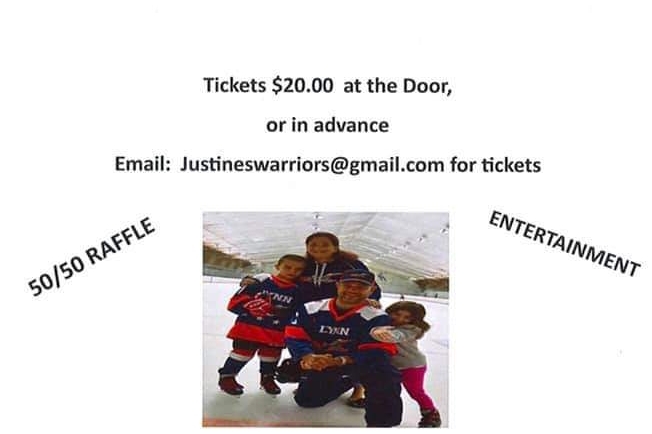 We would like to first and for most thank everyone who has donated or shared the campaign for #JustineStrong. The support and generosity are overwhelming for the family, but much needed and appreciated. They also would like to thank everyone who have been assisting with the home repairs, child care assistance, rides and meals. Justine recently went to Dana Farber for a second opinion. The doctors at Dana Farber agreed with the current treatment plan Justine is currently undergoing. They did not feel they would do anything different at this stage and feel the treatment plan is the best available to treat Justine’s cancer. They are going to work along with Justine’s doctors as needed. Justine goes to weekly physical therapy to regain the strength in her back, has blood work every two weeks, and her other regularly scheduled monthly appointments. Her blood work has shown that her numbers are remaining stable, which is positive, but Justine does have some days of sickness. The Doctors are not sure what is causing these random days of sickness, but when they hit they take a toll on her and she is physically exhausted. Next month is a big month for Justine. She will undergo several scans. These scans of the cancer will provide the doctors with updated images. They will help the doctors decide if they will continue with the current treatment plan or make any necessary changes. 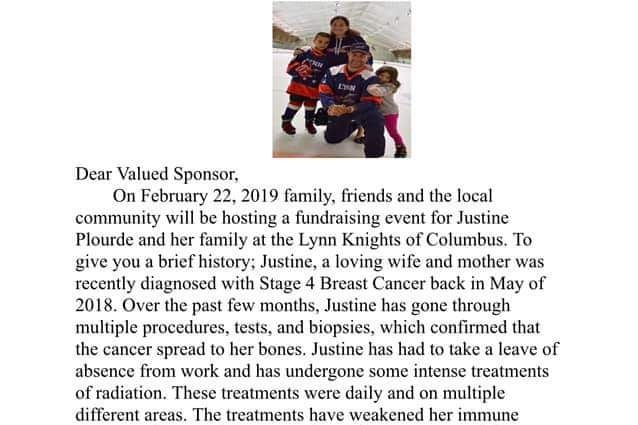 As the saying goes “when it rains it pours.” We have had to watch Justine and her family contend with other unfortunate and difficult times. After a recent rain storm, Justine and JR lost their entire basement due to flooding. They have also been involved in two car accidents. Thankfully, everyone was ok, but the family did lose a vehicle to damage. It was rear-ended by another car and had to be totaled. Justine and JR are both strong and have persevered through it all! 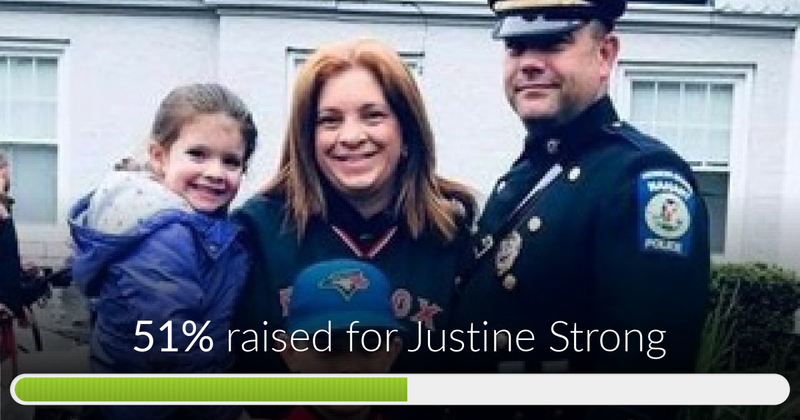 Justine Strong has reached 51% of its goal. Thanks to Cindy & Tom, Lee-Anne and Nahant.